Play with Aramith pool balls and get more fun out of your pool table! Aramith balls are used by almost 80% of the players worldwide and are recognized as the reference of the industry. Their consistently reliable performance guarantees players the pleasure of razor-sharp precision, and their exceptionally long product life offers table owners the lowest ball cost on an annual basis. That’s how Aramith has maintained its legendary reputation as the definition of true and unrivaled quality for half a century. 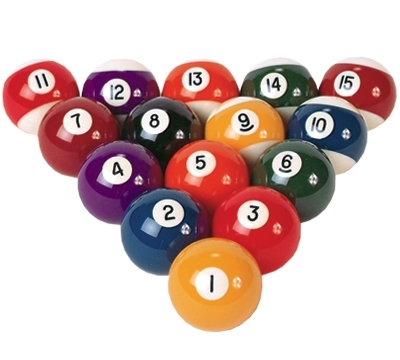 The Aramith Premier Belgian ball set are top quality Aramith balls suitable for both commercial or home use. 2.25" regulation size balls, cue ball included. When ordering sets of balls in quantities, extra freight charges may apply.